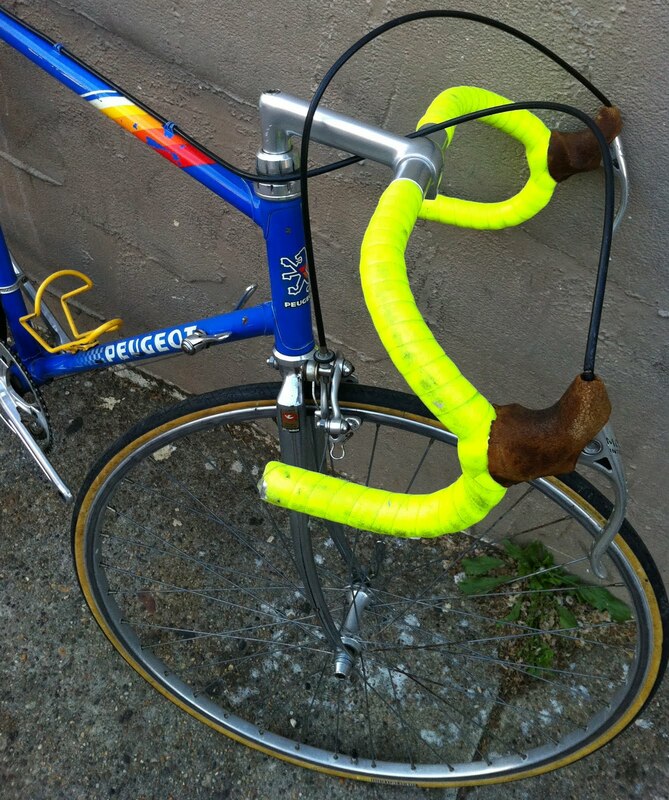 Normally I post vintage lightweights and fancy European bikes, but a customer recently stopped by with this creation. Sure it might not be the most efficient bicycle to ride but it is more about style. It has a nice cafe racer look to it and the nickle-plating is a nice touch. I don't know what model this Peugeot was but it was definitely 1980s and a high end one. 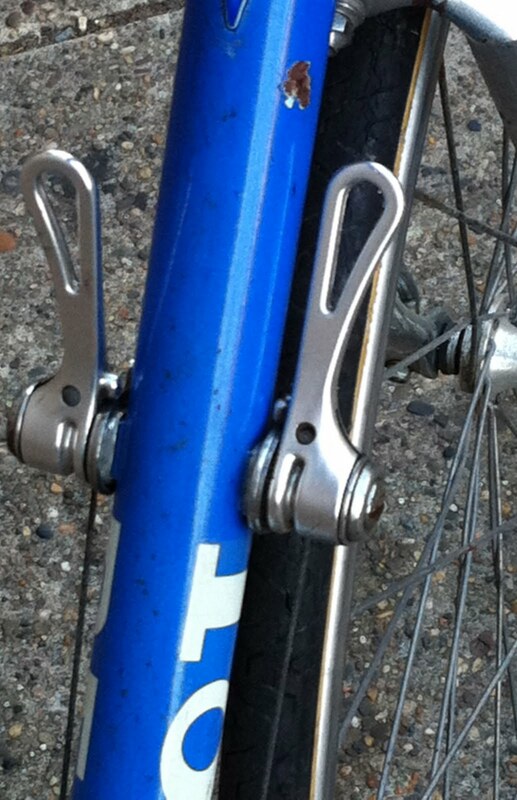 It even had the number plate tab brazed under the toptube. It was also English threaded. 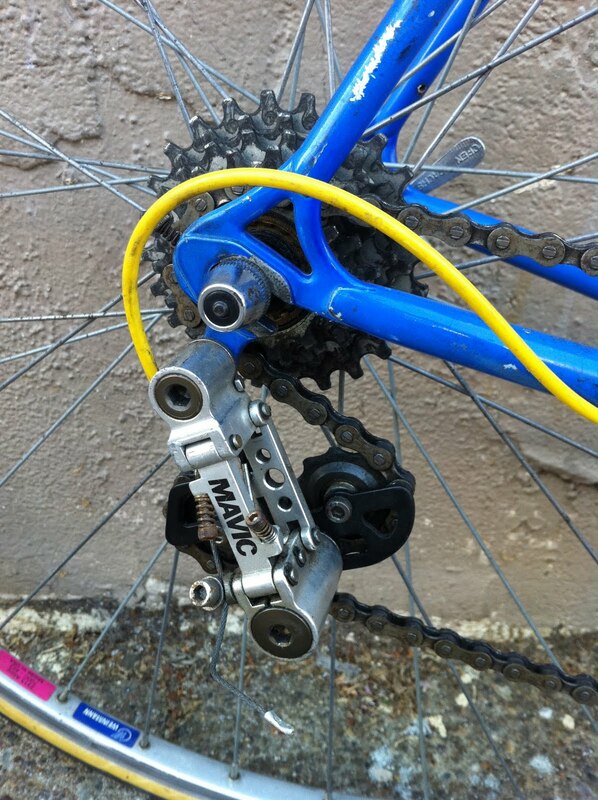 Cool drilled Simplex dropouts that is set up to take a normal rear derailleur, not limited to Simplex derailleurs. I really like this curved brake bridge. very nice touch. 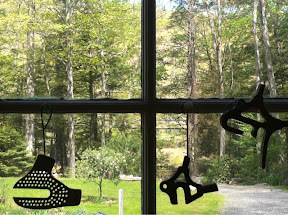 3 interesting dropouts hanging in the window at Peter Weigle's shop. One is a super drilled out track dropout, one appears to be a French vertical dropout, and one is a British dual dropout- it can either be used as a vertical dropout when used with a derailleur or horizontal dropout when used as a single speed. 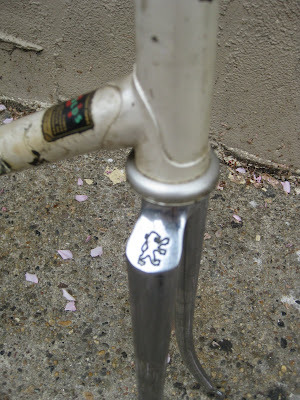 I believe it was manufactured by Cyclo and was found on British bikes in the 1950s. Well 4 years makes a world of difference. When I rode my last 600km, it was a qualifying ride for the 2007 PBP, and I did the ride with the New Jersey Randonneurs bike club and most of the ride was located in South New Jersey and was ridiculously flat compared to the terrain between Paris and Brest. Even with it's lack of challenging climbs, I limped across the finish line and it took a couple days of recovery before I was not in pain walking on stairs. This year I have really made a concerted effort in training- not only with my riding but eating well and stretching. After riding 370 miles I felt great, I could have ridden many more miles. That is such an amazing feeling. As a matter of fact, even after the ride over the weekend, 3 days later, I went for a run. I am now convinced that I will succeed in France and will not be too wiped out after doing it. I'm contemplating writing a detailed ride report, with some of the challenges in doing such distances, and commonly asked questions people ask me- what does one think about while riding a bike for 30+ hours. We'll see. Sure it is unofficial, but I finished my 600km ride on Sunday with hours to spare and many miles left in my legs. I'm feeling really good about going to Paris this summer. 69,645 feet of climbing over the 4 rides, that's pretty good, yes that is over 13 miles vertically. The last ride alone was over 27,000ft, that is almost like riding up Mt. Everest. Sorry to sound so boastful but the endorphins are still strong in my system. Bike rode beautifully, I even reached 50 miles per hour on one descent. Full ride write up to follow. Mechanicals- 2 punctured tubes, broken waterbottle cage, and minor shifting issues. Peugeot from the 1980s. 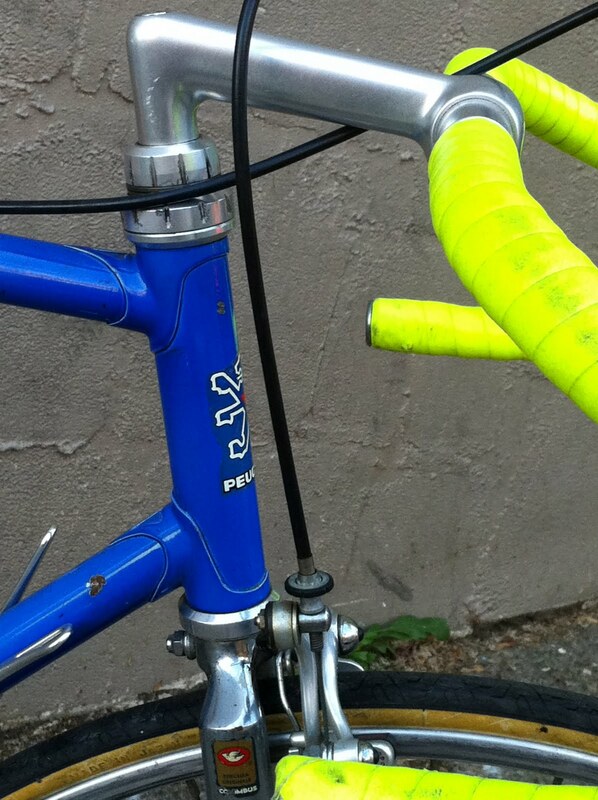 Complete with a Mavic drivetrain(derailleurs, shifters, crank set, bottom bracket, pedals, stem, handlebars, and headset. Modolo brake set. 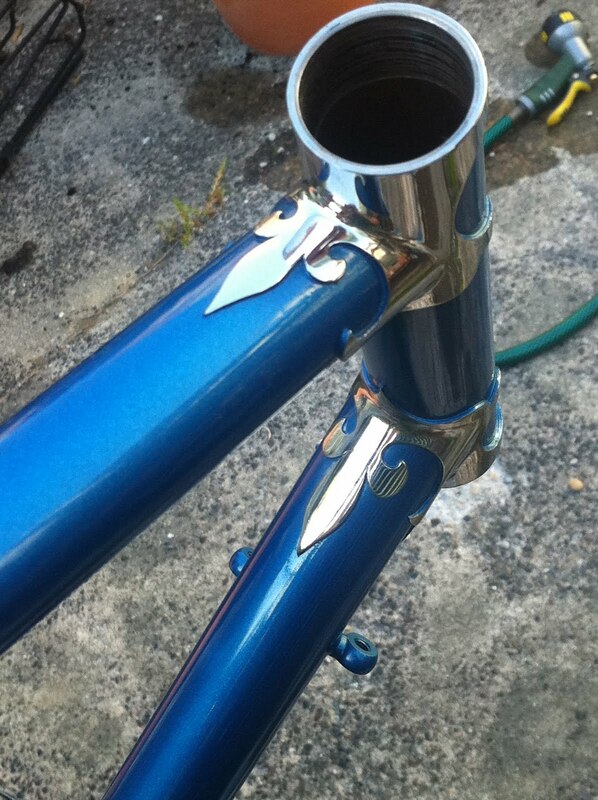 3T seatpost. mallaird hubs and weinmann rims. I have set up the bike to be ridden and to dial in stem length and height, so please excuse the black stem. Simon is going to build me a stem, something that will perfectly compliment the frameset, and also build me a front bag support. I love the French Blue, Bleu Farce. 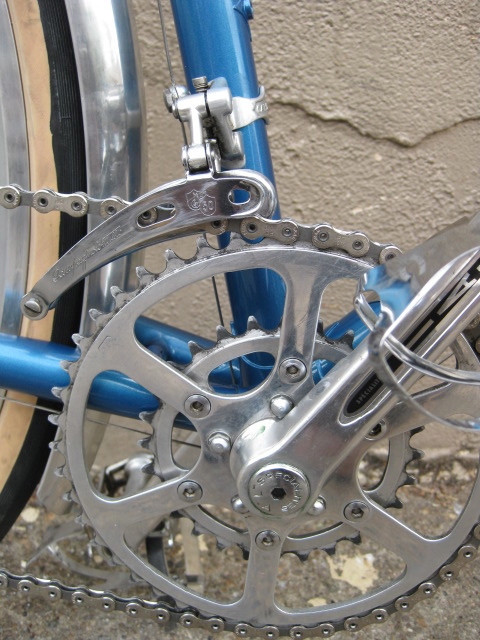 TA cyclotouriste pro 5 vis cranks with 46/30 chainring combination. 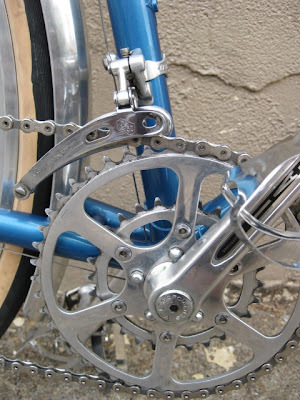 Campagnolo 50th Anniversary front derailleur. Chris King 'no logo' ahead set. Campagnolo alloy Chorus 9spd Ergo shifters converted to 10spd. 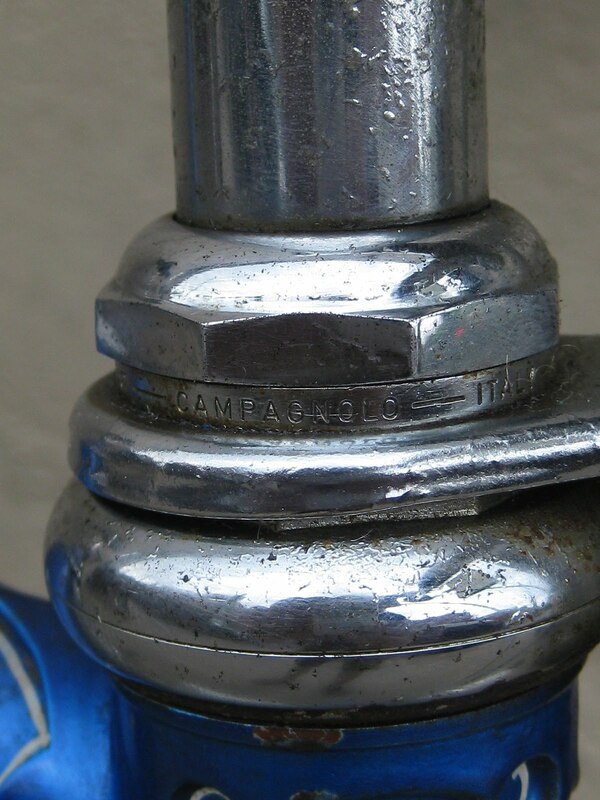 Recent Campagnolo Record seatpost. Paul Racer brakes. Cool old foil Columbus decal. 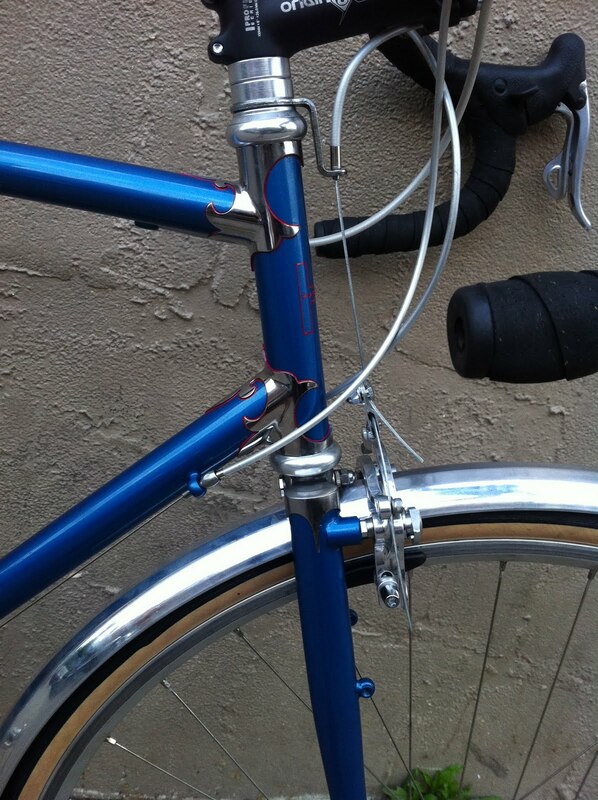 The frameset is built with Columbus Spirit for lugs. Simon did the red lug lining. The weather held back, after threats of rain and the turnout was great. Here are a couple bikes that I saw, and remembered to photograph. 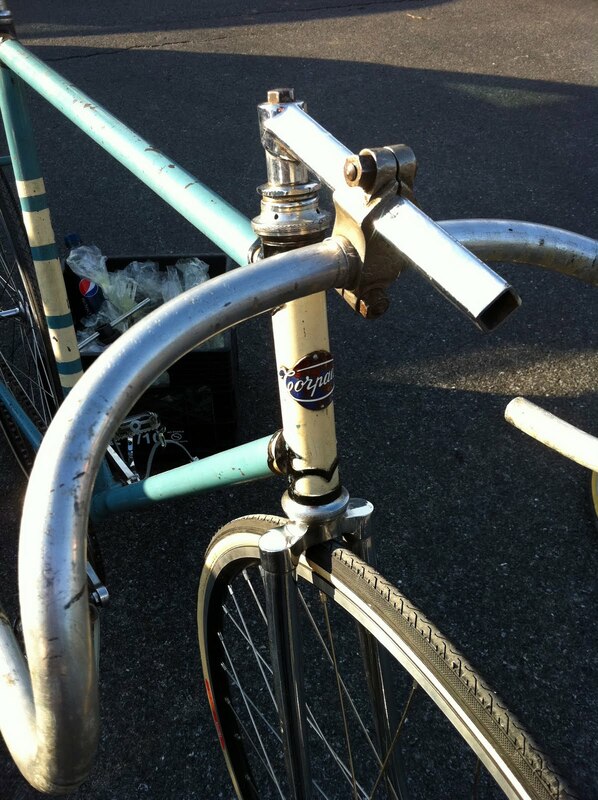 Postwar Japanese city bike with expander rear brake. It is as heavy as a modern Toyota. 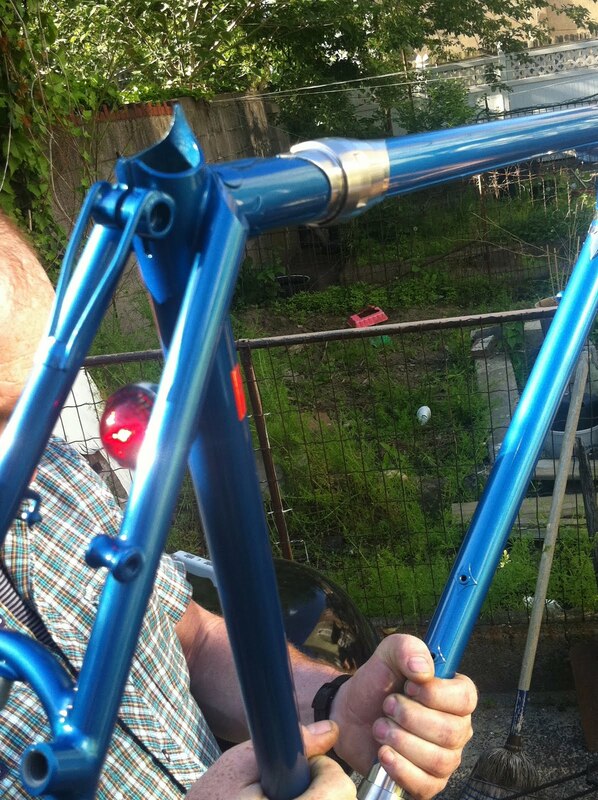 Zeus track frame, that has been outfitted to best fit a messenger??? 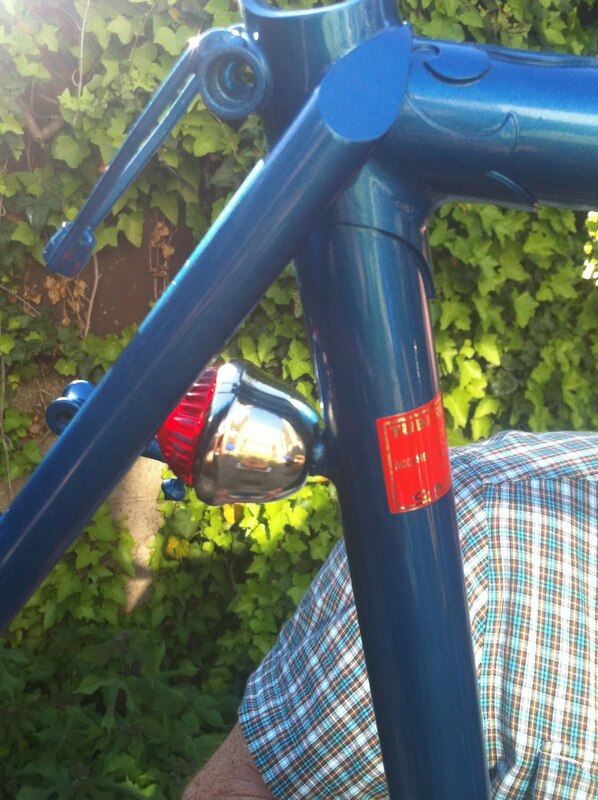 Simon Firth built this bike in 2004 and won Best North American bike at Cirque du Cyclisme that year. What a cool stem,with a six-pence built into it. 1950s French city bike. 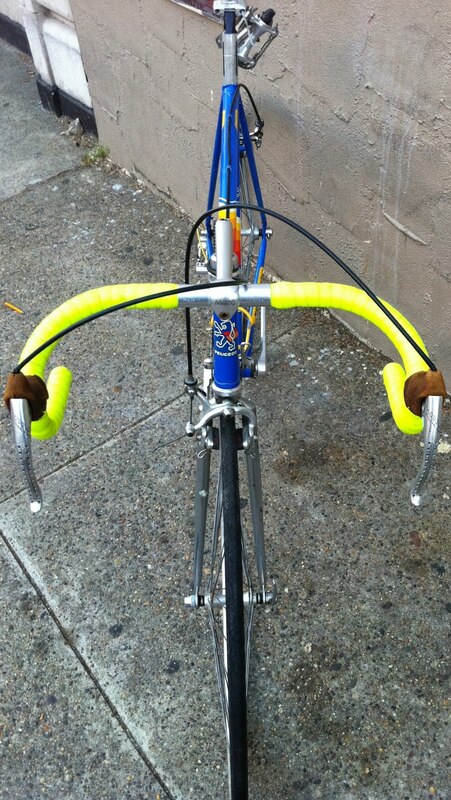 with Prior hubs, Mafac Raid brakes, Stronglight 49d cranks, etc. The great annual NY Bike Jumble is this weekend. Saturday to be exact, May 14th. It is in the Park Slope section of Brooklyn. It is a nice little swap meet in the nyc city area, I think the only one?? More information here about it HERE. Here is a past post about the swap, with pictures. 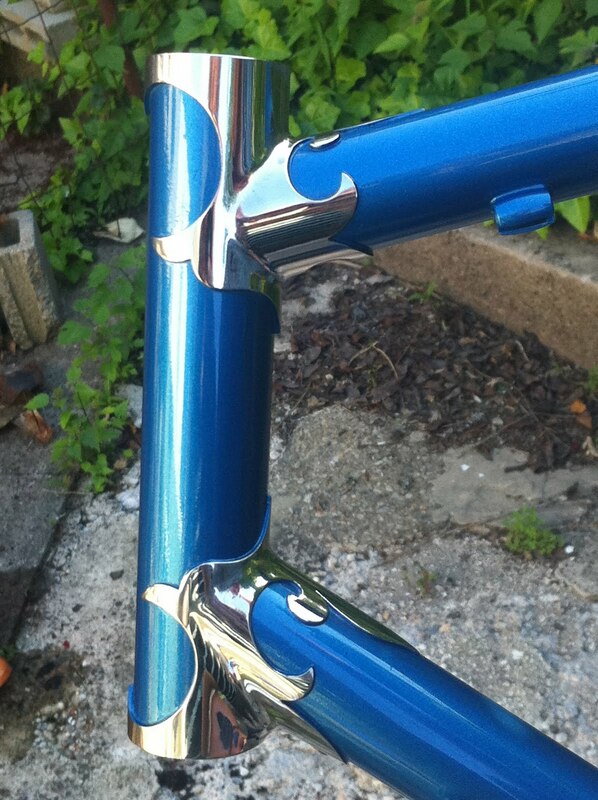 Me and my framebuilder Simon Firth traveled north today to pick up my frameset from the Peter Weigle, who painted it. I pulled a lot of strings and traded a lot of favors to have one of the top framebuilders in the world to paint my first frame. It came out better than I could have imagined. Love at first site. I cannot wait to build it up and ride it. It has has to have the logos handpainted on, that is going to look very sharp, and have some nice subtle luglining. 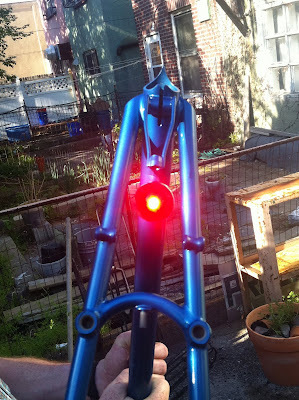 Yes, It will be at the Brooklyn Bicycle Jumble this weekend in NYC. 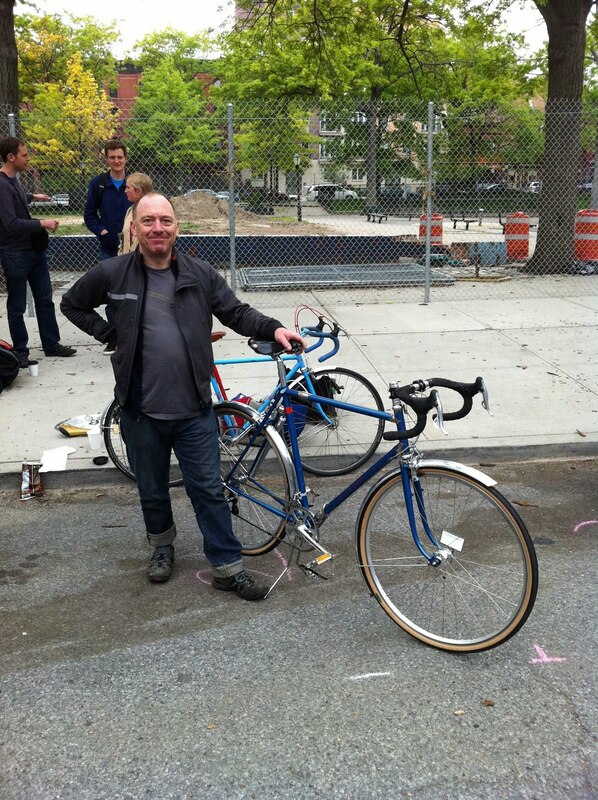 more info about the bike swap meet here. 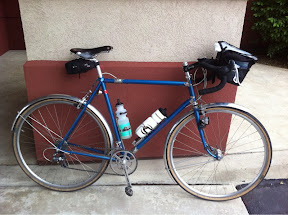 I purchased this bike a few years ago from a fellow Classic Rendezvous listmember and it is a bike I have always looked for. I have owned numerous Paramounts over the years and currently also own a 1968 Paramount track bike but I always wanted a city bike Paramount. This bike was originally set up this way, with a chainguard, fenders, Sturmey Archer AW 3 speed hub, Titan stem and upright handlebars. 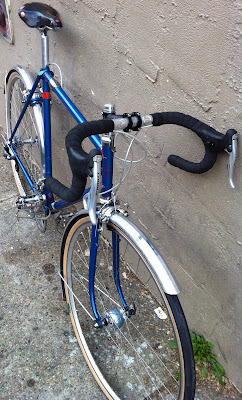 The bicycle also has original Schwinn Paramount cottered cranks, Campagnolo no "Record" front hub, Brooks mattress saddle, early version Weinmann engraved brakes, and dark blue Schwinn grips.